The United States has tumbled in the global health rankings as drugs shave years off the life expectancy. Poor diet and inefficient healthcare also cost the US points in the Bloomberg Healthiest Country Index, which ranks 169 countries and publishes an esteemed ‘top 50’. This year, the US fell to 35th place (from 34th in 2018), far behind peer nations like Spain (1), Italy (2), the UK (19), Canada (16), Israel (10), and Australia (7). The Bloomberg Healthiest Country Index took into account life expectancies, smoking rates, obesity and access to clean water. For the second year in a row, the US also failed to usurp Cuba, a developing country that has been rewarded for focusing on preventing disease (with disease screening, diet tweaks and exercise) rather than treating people after diagnosis. The US has soaring rates of heart disease driven by the ‘Western diet’ rich in saturated fats, sugar and processed meat. But the biggest blow has been from prescription painkillers, which created a nation of addicts and a market for the synthetic drug fentanyl, up to 100 times stronger than heroin, which has been laced into everything from street drugs to Percocet. In the last eight years, more than 200,000 Americans have died of drug overdoses, driving down the life expectancy from 78.8 years to 78.6. Spain, which is forecast to have the longest life expectancy in the world by 2040 at 86 years old, was crowned the healthiest country in the league table this year. Currently, it falls behind Japan and Switzerland in terms of life expectancy. But a number of factors are driving Spain up the ranks. It has a strong public health workforce, which delivers efficient care to women, children and the elderly – groups which often fall through the cracks of other health systems, according to the University of Washington’s Institute for Health Metrics and Evaluation. Spain has also aggressively driven down rates of heart disease in the last decade. And, crucially, it has a young population, unlike Japan. Although Spaniards are avid meat-eaters, they conform to a Mediterranean diet, with fewer saturated fats and far less sugar than Americans. Italy slipped to the second spot. The rest of the top 10 was completed by Iceland, Japan, Switzerland, Sweden, Australia, Singapore, Norway and Israel. The countries in the top 50 which made the biggest improvements on the previous index, in 2017, were South Korea – which rose from 24th to 17th – Estonia, which rose six places from 38th to 32nd, and Albania, which rose from 50th to 43rd. Meanwhile, Macedonia was the biggest faller – dropping 12 places from 44th to 56th. 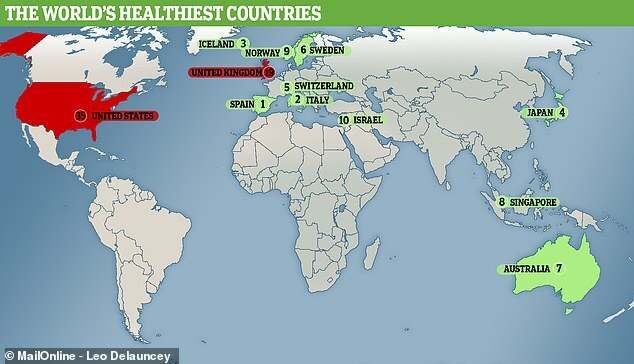 A separate ranking of healthy countries done last year, by educational charity the Legatum Institute, claimed Spain was the 22nd healthiest country. Scientists regularly publish studies praising the health benefits of the Mediterranean diet, which contains a lot of vegetables, nuts, fish and oils. It is known to improve heart health and also believed to be good for the brain and liver, and may improve sexual function in men. Although the Legatum’s Institute ranking is at odds with Bloomberg’s assessment, there is crossover in the top 10 on both lists. Singapore, Japan, Switzerland, Sweden and Norway all feature in the 10 healthiest countries on both Bloomberg’s and Legatum’s lists. No African nations made it into the top 50 of today’s index, and only a handful of those in the Middle East did – Bahrain, Qatar, Lebanon, Brunei, the United Arab Emirates and Oman. Countries in sub-Saharan Africa – where access to clean water and sanitation are lingering issues and deadly diseases are rife – made up 27 of 30 unhealthiest countries. Haiti, Afghanistan and Yemen were all also among the worst performing. Consuming more fruit and fish, and fewer sugary drinks and snacks, are the most important aspects of a Mediterranean diet.